Yeah, but: It's perfect for someone, but maybe not for me. The Long Version: Sony makes a couple of cases for the PCM-D50 digital field recorder: there's the widely available LC-PCMD50G, which is a clam-shell style, and the CKL-PCMD50 model that was originally only available in Japan. It's since become more widely distributed, and it's the one that I bought with my recorder. The CKL case is the audio equivalent of the ever-ready camera cases that used to be popular. Like a never-ready camera case, it attaches to the tripod mount and flips around when the recorder is being used, but doesn't get taken off of the device. It also comes with the wrist-strap that you see in these photos, which is nylon with leather, and a soft grey fabric bag that's big enough to add extra scuff protection to the whole assembly. The case is designed to double as a stand, which it does reasonably well. The photo above is its 'high' configuration, and it's held in position by some magnets that are built into it. 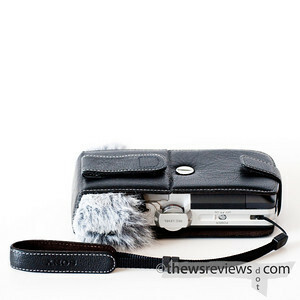 As you can see, the leather case is quite stiff, and provides ample protection for the recorder. 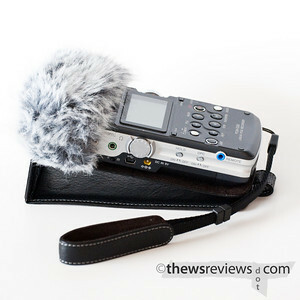 For carrying around to interviews, recording sessions, and for ENG I can see it working quite well - any situation where the recorder can be put down somewhere clean and conveniently near the sound source. 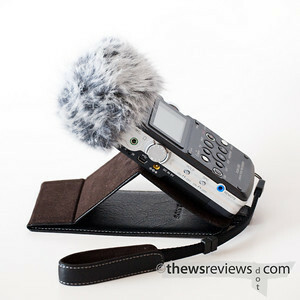 For 'stealth' recording, put the Sony D50's mics in the wide stereo position, and the case doesn't even need to be open. Naturally, you can't reach the front-panel controls, so start it going and then toggle the 'hold' switch on the side (to prevent the 'stop' button from getting pressed - I learned that the hard way) before closing the case. The tour of the CKL flip-case ends at the back, where you can see (from right to left) the snap-button clasp, the coin-activated attachment screw, and the belt loop. That's really the first thing that seems like it isn't very well thought out; the belt loop has a simple snap to attach it, and doesn't seem particularly secure. I would hesitate to use it to actually carry the recorder, but it does come in handy for holding the wires on my earphones. For carrying the recorder hands-free when it's being used for field recording/ENG with an external microphone, it might be perfect - but people who plan on using a decent external mic probably aren't using the PCM-D50. I could be wrong, and probably am, but adding an overlapping snap for security certainly wouldn't hurt. 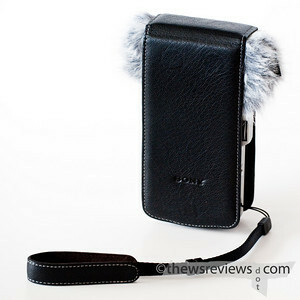 Personally, I haven't quite settled on how I use the PCM-D50, so I also haven't decided whether or not I like this case. It's great for carrying it and setting it down on tables, but I don't often do that. I'm much more likely to be hand-holding the recorder for environmental sound gathering, and for that I need to be really careful because the self-noise that the leather case generates is far worse than the handling noise from the bare recorder. And for serious sound recording, I need to remove the case completely so that I can use the D50 on a tripod - and then I need to make certain that the heavy leather wrist strap doesn't hit the stand. It's not cheap, so think about how you use the recorder before you go out and buy one - but if it's right for you, then it really is a great case.